The SOS ARA XL has a number of features important for rescue use. The blade has a slot and twin pegs to aid opening with either hand and with gloves. Cut in a "combo" blade (partially serrated), the slight curve and rounded safety tip aid in cutting on the pull and the handle includes a curved slot for cutting through ropes. Included are a seat-belt cutter, 10.3mm hole for attaching a carabiner or rope, glass-breaking nib, and a 1/4" bit holder complete with a neodymium magnet. This version has a handle made of Micarta for beauty and grip. Click here to order this knife now. All of these excellent outdoors and rescue knives are available for ordering directly from Antonini Knives USA. 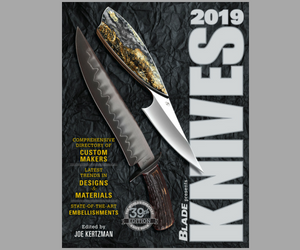 Previous articleKA-BAR Acquires Ek Commando Knife Co.